All Five Service Branches, USAF, USA, USCG, USMC and USN are Applicable. 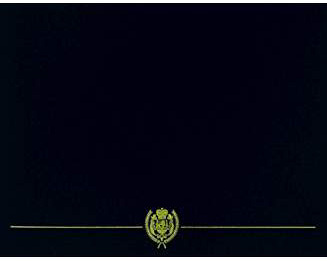 An unaltered photocopy of your Report of Separation displaying your service between 28 September 1945 and 31 December 1991. The Cold War Medal supplements the official Cold War Era Certificate which is authorized to all active, Reserve, Guard and former military personnel of all Service Branches and all Nations allied in the Cold War against the Soviet Bloc who's military service or obligation was served between 26 September 1945 under President Harry S. Truman to 31 December 1991 under President George H.W. Bush. Members of the Merchant Marine must possess a DD-214 issued by the United States Coast Guard. Although the Cold War Medal may not be worn on the uniform of active duty military personnel, it may be worn on the uniform of all former service personnel during military Holiday's and celebratory occasions. The Cold War Medal may be displayed in shadow boxes. See the Order of Precedence for wear and display protocol. Former Personnel: The Cold War Medal may be worn on the uniform of all former service personnel during military Holiday's and celebratory occasions. 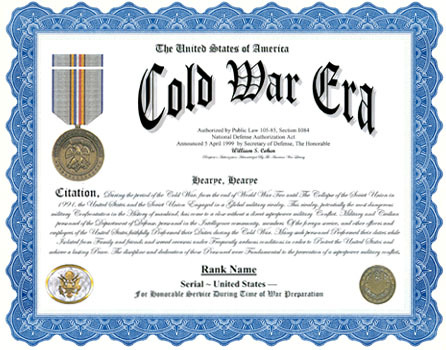 The Cold War Medal may be displayed in shadow boxes. See the Order of Precedence for wear and display protocol.